Splash pages, you gotta love 'em. A blank canvas where the artist can hit you with a large dose of illustrated 'wow'. This week, I realised hardly any of that large dose of wow on this site is from George Perez, despite him being one of the all-time greats. 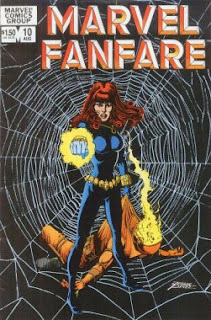 Like that time in Marvel Fanfare where he drew the Black Widow interupted in the shower by a gang of... Oh you didn't read that one? Here let me help you. No wiseguy, Widow doesn't shower in her clothes. The pages prior to this were without her battlesuit and judging from her fallen foe in this splashie, what sights his eyes were privy to before she dressed were obviously so hot, they burned his corneas out. 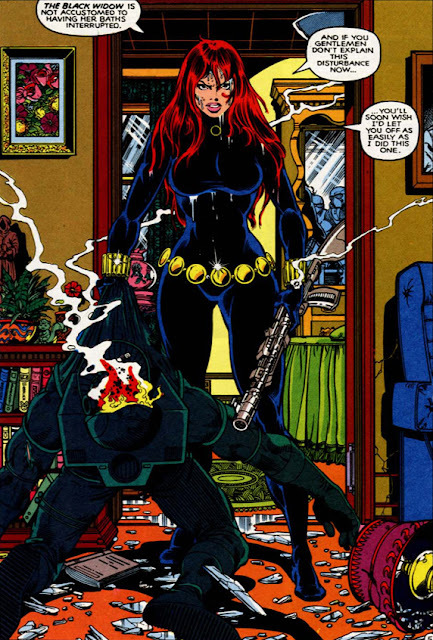 George Perez for his part never skimps on detail, and his style surprisingly suits Black Widow to a point it makes me think that if Natasha gets another shot at a series after Avengers vs X-Men, it'd be sweet if Perez got to be the one to draw her. This was the first ever issue I read with the Black widow! She left me some impression! Nice Aliera - that would've been some first issue! It was! I still remember it! Hey Robert - isn't that how all good spy novels start? It was always pretty hard keeping track on where the widow would pop up next in the Marvel Universe, but with Avengers the movie giving fans more widow bite - I doubt that will be a problem for long! What do you guys think? I bet that guy's last thought before he lost consciousness was "it was...worth...it!"